Like their aquatic namesake, the many different coral tones are a sight to behold. Unlike deep reds and bright yellows that are striking at a glance, coral is the opposite as its soft shades of orange-pink to salmon until baby pink calms you into relaxation. It’s not surprising then that the color coral typically represents calmness, tranquility, and warmth. Thus, a garden of various plants blooming coral flowers will bring similar pleasant emotions if not more. It’s this love and high regard for coral flowers that make them a favorite as cut flowers during special events such as weddings and anniversaries. Therefore, if you’re thinking of adding the color of serenity to your garden, consider these event-worthy coral flowers on our list! I’m starting this list with the Snapdragon partly because they’re incredibly easy to grow, is somewhat tolerant of drought, sweetly fragrant, and make beautiful cut flowers. As lovely as these characteristics are, the main reason I chose these first is that of the sheer beauty and variety of the Snapdragon’s flowers that bloom atop tall spikes. The Snapdragons coral-colored variety are in the Speedy series, such as the Speedy Sonnet Bronze and Speedy Sonnet Rose varieties. These cultivars feature coral tones ranging from orange-pink to pink-fuschia. Horticulturists refer to this annual plant as the Common Zinnia and yet, one look at its adorable blooms, and you’ll admit that its alternate name, Elegant Zinnia suits it better. Moreover, the Zinnia is also easy to grow as long as you remember to give it a lot of sunlight! Ultimately, the Zinnia will reciprocate the love and care you give it by rewarding you with a long blooming season and unimaginably beautiful blooms. You can find the coral cultivars of the Zinna in the Giant Salmon Rose and the Peter series. These varieties display the coral shades of light pinks, salmon, apricot, and orange. Here’s another charming coral plant that’s gardener-friendly and trouble-free! The Sea Pink or Sea Thrift plant is perfect for catwalks or as a border plant since it grows in clumps. Then, feast your eyes on the sea of delicate white to pink flowers come spring! Also, a bouquet of attractive Sea Thrifts would be perfect for wildflower-themed weddings and events. Being a trouble-free plant, the Sea Pink is resistant to pests and disease while it attracts butterflies and bees! There was no way I couldn’t include a Peony or two on this list simply because the genus Paeonia has one of the widest and most beautiful coral-colored varieties! A great example is the Abalone Pearl with its pinkish-white petals resembling see shells that open to reveal golden yellow stamens. The Abalone Pearl cultivar is one of the earliest Peonies to bloom and makes for a fantastic cut flower! Imagine the flower arrangements and bouquets you can display with cut peonies that last more than a week! 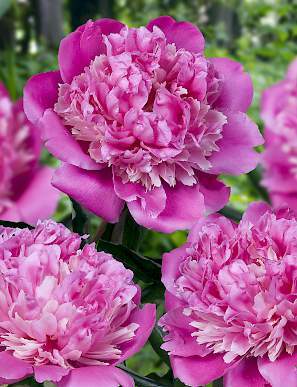 Of course, one can’t forget one of the oldest and most fragrant Peony of all, the Philomele. Similar to its kin, the Philomele is a markedly rewarding plant as it blooms in profusion during late spring to early summer and also lasts more than a week when cut! Despite the beauty of its coral flowers, in shades of lavender-pink and amber-yellow, the Philomele is an undemanding plant as long as you give it shelter and support. I’m not exactly sure who Sharon is, but she must see it a privilege for the Hibiscus syriacus to carry her name, most especially the SugarTip cultivar. 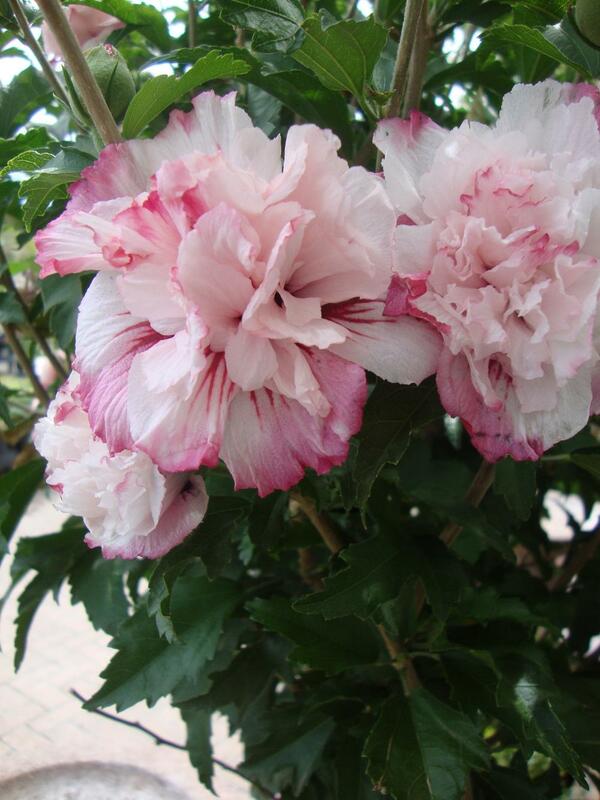 The SugarTip variety of the Rose of Sharon boasts profusely blooming double light-pink flowers! The coral shades of the bloomsare perfectly framed by the plant’s dark green foliage edged with white. To encourage more of these eye-catching blooms, ensure regular heavy pruning! I do enjoy including flowers that the Royal Horticultural Society has deemed worthy of its Award of Garden Merit (AGM). 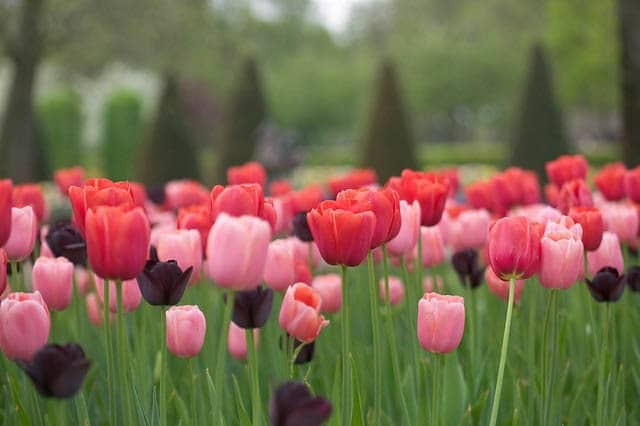 It’s not surprising though that the Menton cultivar of the Tulipa is a recipient of this award. In fact, it’s safe to say that the Menton accurately represents royalty, with its sturdy stems and the majestic egg-shaped flowers in coral shades of rose pink to apricot! There you go! 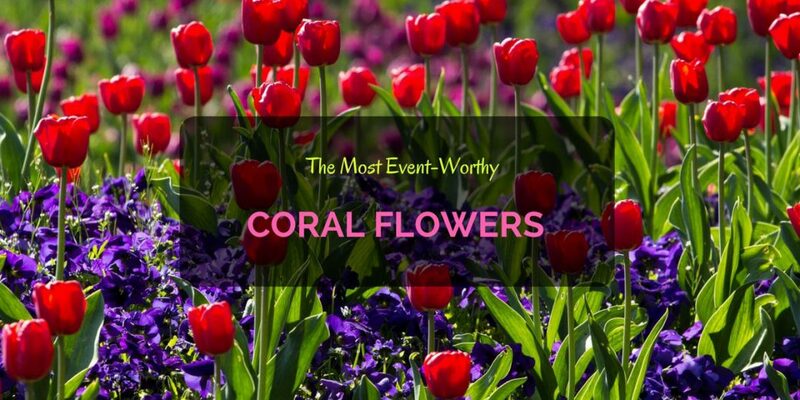 That’s our list of the most event-worthy coral flowers! Tell us, did we miss any of your favorite coral-colored blooms?